Mystic, about the midpoint between NYC and Boston, is a fantastic getaway. In less than a two-hour drive, our family left the sweltering heat of the city for some quiet time in this quaint riverside community. Long before Julia Roberts and Co. made Mystic famous with a little film about a local pizza place (more about that in just a bit), Mystic was a shipbuilding town — there’s a rich history here to enjoy along with a sunset sail and walks along the river. This rustic, romantic spot was the perfect place to celebrate my wedding anniversary. I’m not usually especially jazzed about tofu, but my Smoked Tofu Salad (quinoa, spinach, mint, roasted carrots, toasted peanuts & ginger apricot dressing) was one of the best salads I’ve had in a long time. My husband Seth opted for the Crispy Tofu Burger, and there’s also a Portobello Burger on the menu. Definitely start with the Black-Eyed Pea Hummus, served with crispy sesame flatbread. Sister restaurant of The Engine Room, a little more upscale and intimate. When we made our reservation, we gave them a heads up the vegans were coming, though there is a salad and entree that are already do-able. When we arrived, however, the chef wanted to surprise us a bit. So, in lieu of the salad on the menu as a starter, we were served fresh blueberries and basil drizzled with olive oil, and then an equally simple but bursting-with-flavor tomato salad. The entree — available on the regular menu — was a delicious mild tofu curry. If you’re up for a cocktail, I recommend a classic martini made with a local Connecticut vodka. Reservation for 8pm at the Oyster Club? Head over early to allow yourself time for a drink at The Treehouse beforehand. You’ll climb the wooden stairs to an expansive deck area situated in the treetops — a little playful, a little magical — for a beer, a glass of vine or perhaps even a fruity cocktail. If you’re visiting Mystic, this one-of-a-kind place is not to be missed. A casual atmosphere, with a delicious black bean burger on the menu. We topped ours with sauteed mushrooms and carmelized onions. 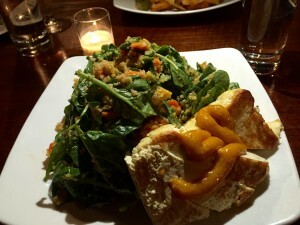 A nice (and inexpensive) meal, and also very family-friendly: a great choice if you’re traveling with kids or a group. 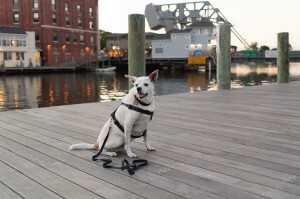 In the heart of downtown, just a stroll away from the drawbridge across the Mystic River. 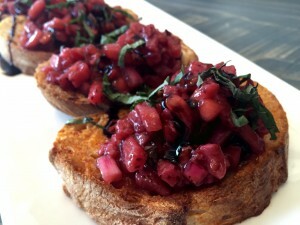 We had a wonderful lunch here, lured in by the Strawberry Basil Bruschetta on the menu, which did not disappoint. We then split a Veggie Panini that was absolutely de-lish: the grilled zucchini, squash, and roasted peppers were cooked just right — not squishy and soggy! And there was a light schmear of black bean hummus on the fresh, slightly crispy bread. I know a veggie panini may not sound particularly exciting but, trust me, this is the way it’s meant to be done. 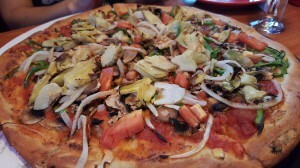 So here’s the pizza joint with all the vegan goodies. Lightlife and Gardein products are listed on the separate vegetarian menu that offers all sorts of specialty pies and sandwiches. Meatless meatballs, sausage, and “chicken” are all here. So is vegan Daiya cheese. Lunch or dinner here is a completely different pizza experience from one at Mystic: the thin pie crust is light and crispy; the large patio dining out back is dog-friendly, so our Galileo got to enjoy some pizza with us. Our choice of pie? 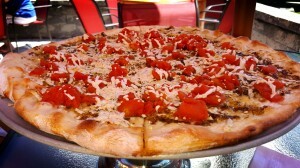 The Pesto Splash, a “white” pie lightly brushed with pesto, sprinkled with Daiya, and topped with fresh diced tomatoes. Eat in or take out at this cozy little market. Although the deli area has a couple of veg sandwiches and wraps made to order, we decided to create a plate by choosing from a variety of prepared salads. My plate: wakame salad, Asian cabbage slaw, and roasted sweet potatoes with black beans. Seth was in the mood for a heavier lunch of vegan dumplings and noodles. We always want to make sure our family vacation is a comfortable, relaxing, and fun experience for our Galileo, too. Most times, we’ll opt for a dog-friendly B&B. For this trip, we went with a more conventional hotel experience. A couple of the days we were visiting were particularly warm and humid, which meant Galileo stayed in the cool air-conditioned room for a lot of the day, whether with us or while we were out exploring. The dog-friendly rooms at The Hyatt ($75 non-refundable fee) include a separate sitting and kitchen area, so he had plenty of space to move around. A main attraction in Mystic is its Aquarium. However, as an animal rights advocate, I strongly urge you not to support this kind of use of animals. Steer clear of the aquarium! If you’re interested in seeing marine life, keep driving north and get yourself to Cape Cod, where you can see dolphins and whales in the protected Stellwagen Bank Sanctuary. The Mystic Seaport Museum, on the other hand, is a must for the to-do list. 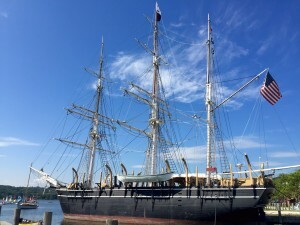 It’s a bit pricey ($25 for an adult ticket) but that one ticket gets you into quite an impressive set of exhibits and attractions, everything from old ships to the recreation of an 1800s village and shipyard. I was particularly interested to see the last surviving wooden whaling ship, the Charles W. Morgan: as I walked through the rooms of the ship, I was reminded of my Literature days spent poring over Melville; I also was feeling very thankful for the Marine Mammal Protection Act of 1972, which protects marine mammals (including whales) within U.S. waters. For some beach time, I highly recommend taking the short drive (25 minutes) to nearby Watch Hill, Rhode Island. The surrounding neighborhood is beautiful, kind of a smaller-scale Newport; the water is clear and not too rough, so swimmers of all ages can enjoy the day. Find your parking near the center of town and the Watch Hill & Carousel Beach; then walk up the street towards The Ocean House, where you’ll find a short path to the free public East Beach. 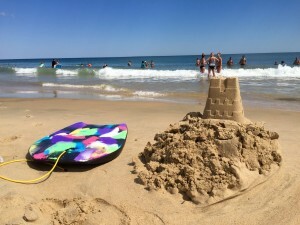 Less hectic than the shoreline at the carousel, it’s the perfect place to relax, build a sand castle, and soak up the sunshine.